Christmas CDs are usually kept tucked away until the holiday season. Polka songs typically only emerge at weddings or festivals. I find the same thing holds true for baby carrots. They are often only made for special occasions such as holidays and formal dinner parties. It doesn’t have to be that way. In our household there is usually a bag of baby carrots hanging around our refrigerator crisper. We have good intentions to snack on them but we tend to only get through half the bag. I never like throwing food away so before the little orange beauties hit their expiration date I cook and serve them as a side dish for...get this...an everyday weeknight dinner. Crazy but true. For those who want to break tradition and serve baby carrots as part of a weeknight meal, here is a tasty low-fat way to prepare them. They come together in a snap! 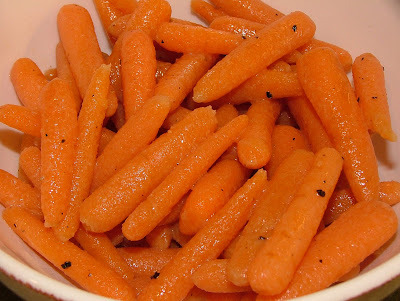 In a deep 10-inch skillet, place baby carrots in water with butter, sugar and salt. Bring water to a boil. Reduce heat, cover with lid and simmer for 7 or 8 minutes. Remove lid and raise heat to medium high. Reduce water until it almost evaporates, about 2 minutes. Add lemon juice. Toss carrots in sauce and season with salt and pepper to taste.